Will Urban Farming Revolutionize Sustainable Food Production? Eating local has taken a more hands-on approach recently as small plots of community-based farms have sprung up in cities all over North America. 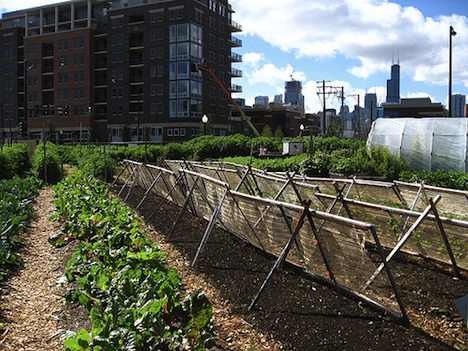 These small plots of farmland located in city centers have been referred to as “urban farms”, and are poised to encourage urban dwellers to rethink food production in the 21st century. The underlying purpose of urban farming is to integrate agriculture in urban environments – environments traditionally separated from the food production realm. Common places to find urban farms are unused public spaces, shared community gardens, and downtown rooftops. While five years ago, urban farming was once a small movement amongst passionate eco-conscious urban dwellers, it has gained increasing support from urban dwellers, city officials, and academic institutions. Even university students are jumping at the opportunity to complete internships at urban farms. The Brooklyn Grange farm in New York went from two interns to more than 15 over the course of a year. The growing popularity of urban farming does not seem to present too much of a surprise. It provides urban inhabitants with a chance to grow their own food and connect more with nature. But one should not get the impression that it is easy work. Caring for an urban farm requires significant amounts of labour: planting seeds, turning compost, watering plants, maximizing crop production, and other often physically intense activities. But despite the hardships associated with urban farming (or perhaps because of them), urban farming imbues in urban dwellers a greater appreciation of the natural cycle and how fundamental food production is for the human species. It also greatly reduces greenhouse gas emissions associated with the transport of food, since most urban farms produce food for immediate local consumption. Most likely, urban farming will continue to flourish in cities around the globe as the world increasingly looks for alternative forms of sustainable crop production. And with innovative new thinking regarding urban food production added to the mix (e.g. vertical farming), we could see cities turning into key places to develop locally grown, organic produce. Already, the United Nations Food and Agricultural Organization is raising the alarm bells about future food security if we don’t change global agricultural practices. Perhaps urban agriculture can serve as a possible solution. Image CC licensed by Linda N.: New crops, urban farm.